Large corporations and startups are coming up with new packaging and food storage options. Plastic litter is producing terrible environmental consequences and destroying the planet. Every day 28,000 tons of single-use plastic are disposed off into our oceans. The world’s population is increasingly demanding that industries reduce their use of plastic in their packaging and single-use plastics. Many people are rejecting products packaged with throw-away plastic and demanding recyclable, reusable or compostable packaging. The situation is urgent. This need for alternatives to plastic packaging and food storage has led to a number of start-ups. So many everyday items we use without even thinking are either plastic or come with plastic packaging. I carefully avoid plastic bags at the supermarket, but I get home and without thinking reach for a baggie, or a plastic food storage container. How do we wean ourselves? Having these alternatives will make that easy. 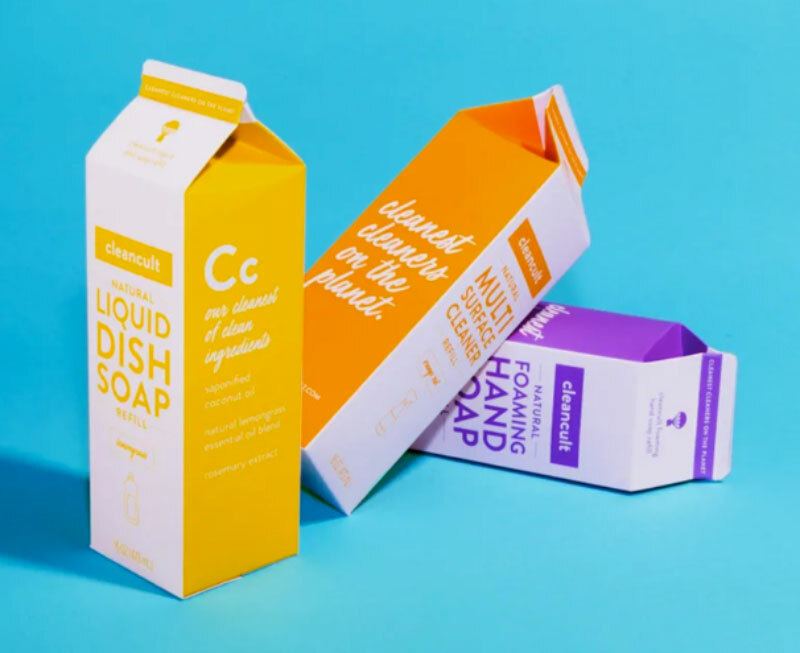 One new startup rethinking product packaging is called CleanCult. It makes all natural, biodegradable, zero waste green home cleaners. To quote their motivation: “Most cleaning products are made with strange chemicals, bottled up in heaps of plastic, and sent to stores with little regard for how they might impact people, or the planet.” All their refills come in the recyclable cartons pictured above. Order a sample kit. You will receive 15% off your first order. If you don’t like their products they will give you a full refund. If you like their products you can sign up for regularly scheduled refills. This would make a wonderful present for someone moving into their first house or apartment! 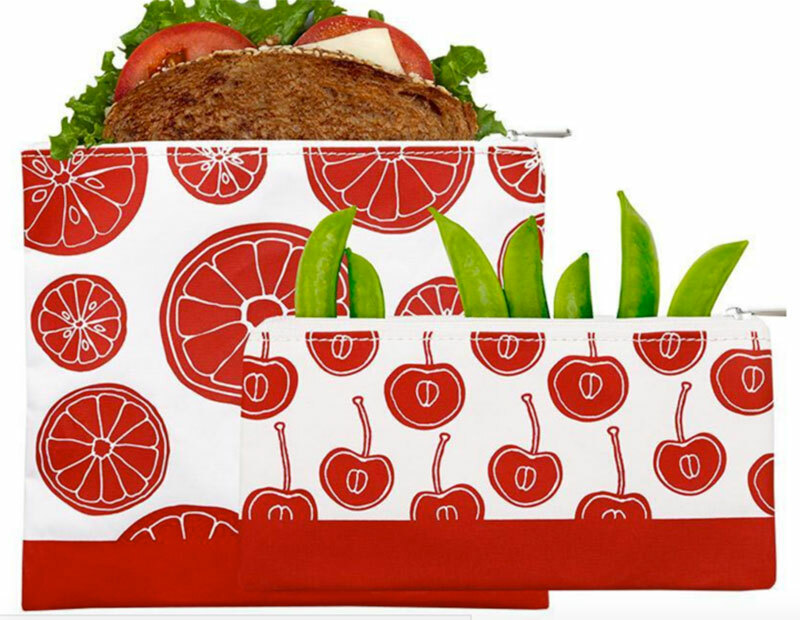 Lunchskins makes dishwasher-safe reusable bags to replace plastic bags. In addition to their reusable bags, they are offering unbleached paper sandwich bags that are compostable and recyclable. They donate proceeds from every order to 5GYRES to help fight pollution in our oceans. 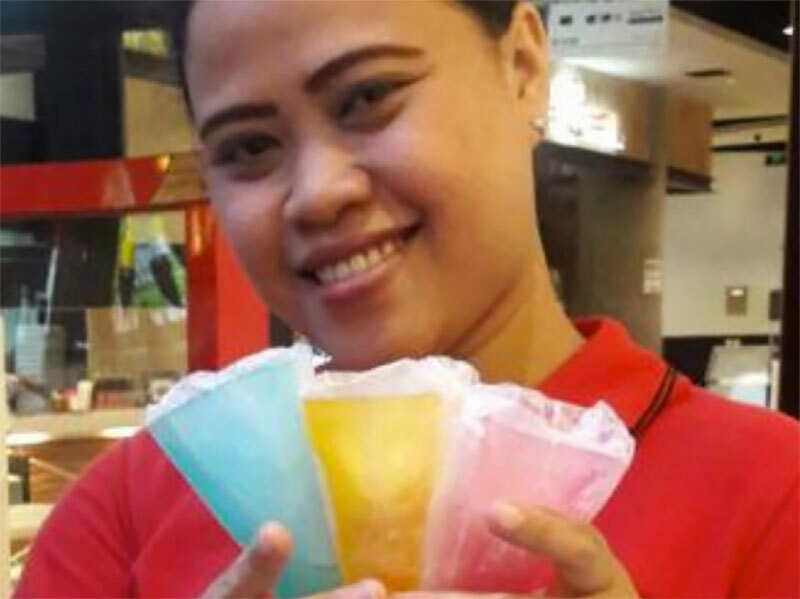 A startup in Jakarta sells ice cream in cups made out of seaweed instead of the usual Styrofoam or plastic. After they eat their ice cream, consumers can then eat the seaweed cup! The food retailer, Ong Tek Tjan, reports that the seaweed cups taste like peppermint, green tea and other flavors. 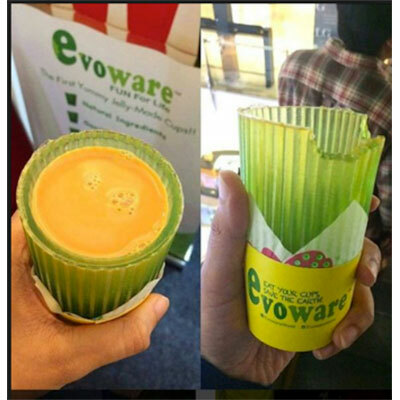 Another Indonesian startup, Evoware, makes the seaweed cups and other containers from farmed chemical-free seaweed. They are called Ello Jello. Stasher makes alternative storage bags out of 100% naturally healthy materials. The bags are eco-friendly, environmentally safe and long-lasting. They come in a variety of sizes and are dishwasher safe. I use them and I love them. 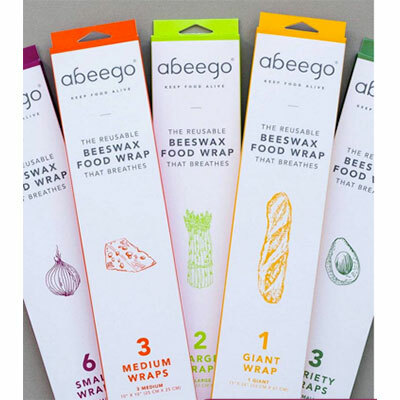 Abeego is a startup that makes breathable beeswax food wrap to replace plastic wrap. It is all natural, made with beeswax, tree resin and jojoba oil, all infused into a hemp and organic cloth. It is self-adhesive. After you use it, rinse it under cold water and wash off with dish soap and a cloth and reuse it. Each sheet can last up to a year. It comes in a variety of sheet sizes. 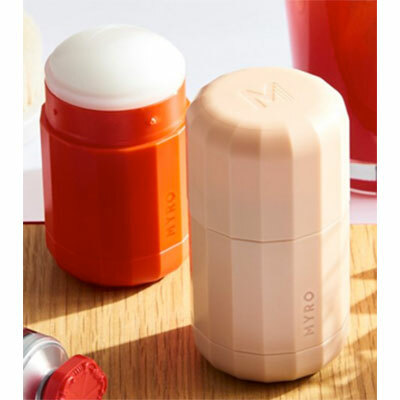 Myro makes refillable natural deodorants made with the purest ingredients. The deodorant is returnable if, for any reason, you don’t like it. In addition, they designed a system for refilling the deodorant container. Pick a case color, choose a scent, and check out. Each case of deodorant is $10.00, shipping is free. You will receive a reminder before a new shipment is sent in case you want to modify case color or scent or skip or cancel the order. 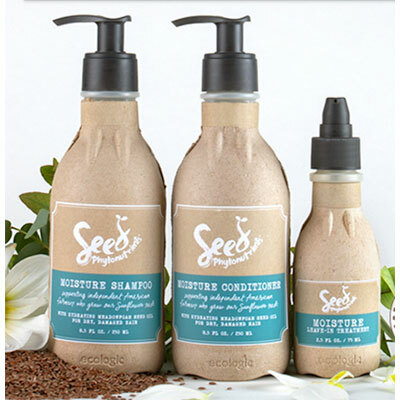 Seed Phytonutrients produces hair and skincare products in biodegradable paper containers. Their products get excellent reviews for being effective as well as sustainable. The line launched a year ago and is under the umbrella of L’Oreal. There are four hair collections – moisture, frizz, color and volume – and each contain a shampoo, conditioner and a leave-in treatment. The paper packaging is very appealing. 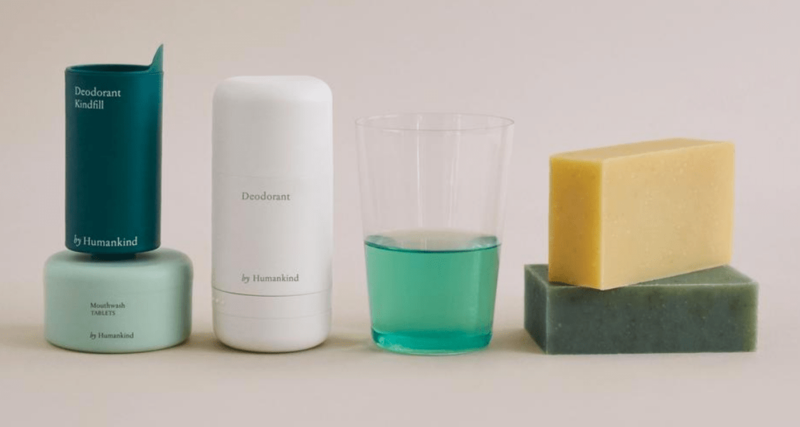 by Humankind is a start-up that delivers its online orders of personal care products to its consumers in plastic-neutral refillable containers. That’s not especially novel, but their products go one step farther – mouthwash comes in tablet form and dissolves in water. Shampoo comes in the form of a bar wrapped in paper, and deodorant comes in a lovely plastic container – its refills are delivered wrapped in paper and designed to be put into the original container, which makes what would have been a single-use container one that can now be used for years. The deodorant is $14.95, the shampoo is $12.95 and the mouthwash tablets are $9.95 for a container. 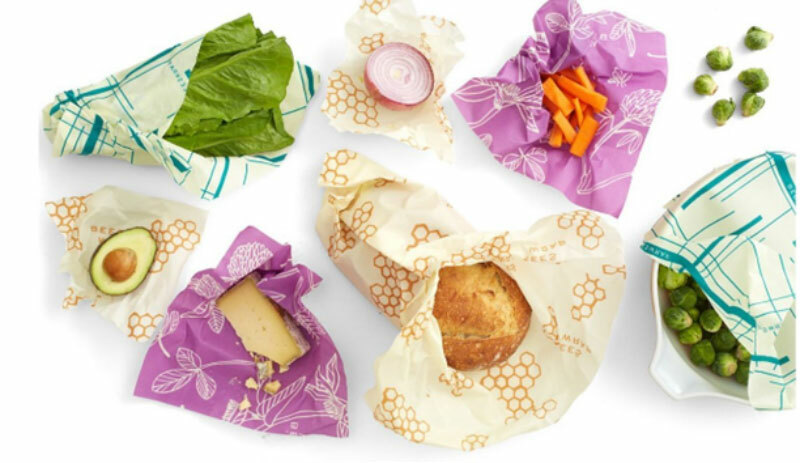 etee is another startup using the adaptability of beeswax to create food wrap that is reusable and pliable. They add essential oils and soy or resin to the beeswax and then infuse it with organic cotton. The result is a reusable, flexible, ‘sticky’ wrap that has antimicrobial properties that help guard against food spoilage. The wrap can be washed in soapy cold water and reused up to 150 times. A package of 3 wraps is $17.95. More established environmentally-friendly companies like Seventh Generation, Method and Mrs. Myers sell refillable laundry detergent and dish soap. To have an effect on our plastic consumption, the large conglomerates need to get on board and decrease their plastic packaging. Investors have demanded that Nestle, PepsiCo, Unilever and Proctor & Gamble reduce their use of plastic packaging. So far, the companies are selling products in reusable containers that can be refilled. Two of Climate Action’s top five companies trying to reduce their use of plastic are MacDonald’s and Evian. MacDonald ’s has committed to make 100% of its packaging renewable or recyclable within the next eight years. Evian has opened a zero-carbon bottling plant and by 2025 will only produce bottles that are 100% recycled. The public outcry has gotten the attention of manufacturing and is having its desired effect. Let’s keep the pressure on and try to stem the tide of the currently predicted 34 billion tons of plastic production by 2050. This ASE article gives lots of ideas for using re-usable food wrap instead of plastic.